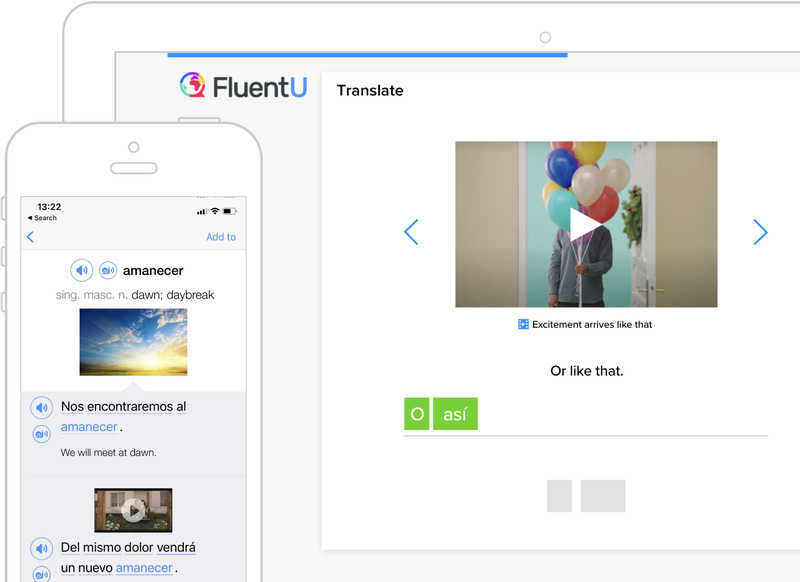 FluentU brings language learning to life with real world videos! 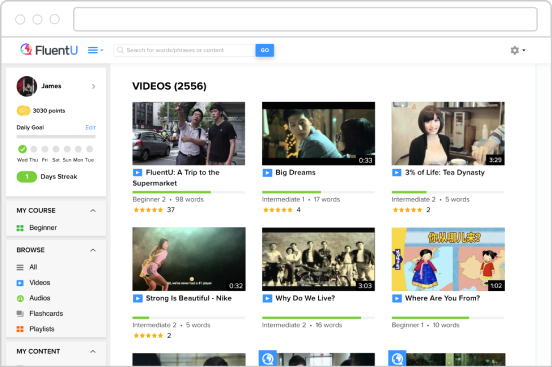 We've searched far and wide for real world video content that's entertaining, timely, and ideal for language learners. Movie trailers? Music videos? News? Inspiring talks? No matter what your interest or skill level, we have you covered. Our interactive captions will bring real-world videos within reach for you. All captions are subtitled and translated. Click on any word to see an in-context definition, along with example sentences. Our quiz teaches you using videos from the real world. The rich, engaging experiences will naturally help you remember and master new vocabulary. Enjoy FluentU wherever you are, whenever you want. Audio dialogues are even downloadable for offline listening. In only 4 months, I've gotten to a comfortable A2 level in German thanks in large part to my practice on FluentU! I'm actually entertained by studying when I use it; it doesn't feel like work! I've learned a little Spanish vocabulary growing up in Texas, but not enough to speak it, by far. Within a week of working on this program I am able to form sentences. 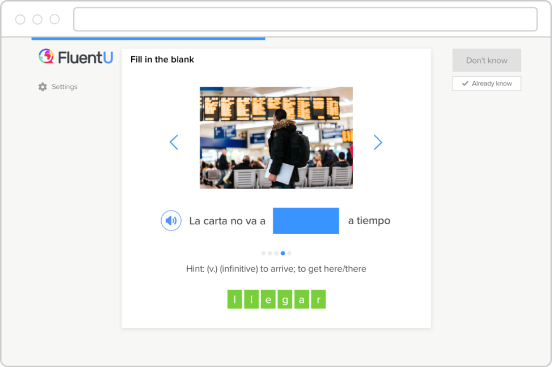 I find rote memorization to be extremely difficult, but FluentU helps me to apply what I'm learning so quickly, it doesn't feel like dreadful memorization, it feels like yo soy una alumna del Español! I am enjoying FluentU. I have been using this site for a couple weeks and I have definitely noticed a huge improvement in my vocabulary. I love that it uses a lot of relevant clips like Norman fait des videos to practice REAL French, and it is presented in such a fun way that it makes it easy to practice. Using this site has become part of my daily routine. I really really like the fact that the videos are real authentic videos. It makes it much more interesting. 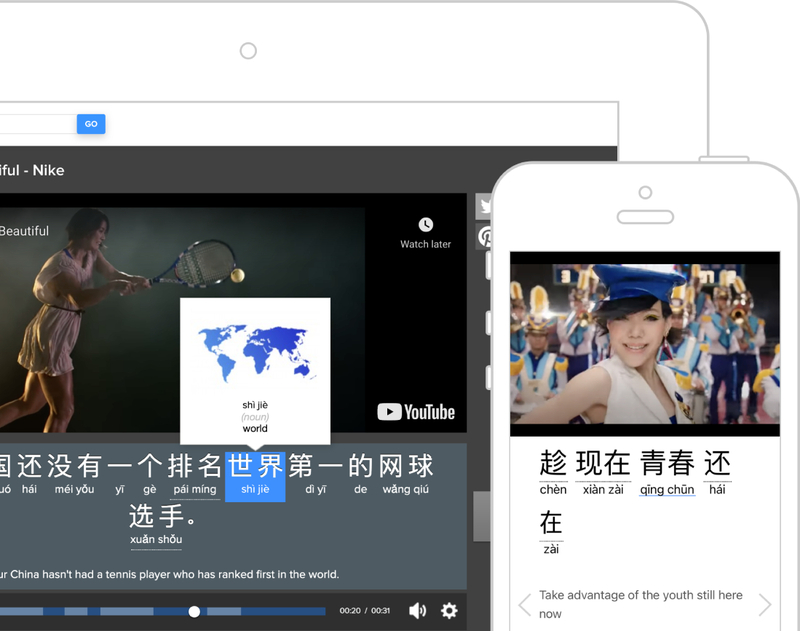 Learning Chinese almost becomes an afterthought to the fact that you are watching cool videos. I love that FluentU uses real content from a diverse range of French media sources and that both the French and English translation are given as subtitles. It's also incredibly convenient to be able to hover the mouse over an unfamiliar word to get a definition while viewing videos. I'm struggling to think of any criticism as it really is an amazing resource. I love how I get to see videos, listen to music and learn about real and relevant aspects of the Chinese culture. I enjoy seeing faces in those videos of actors and people that I can recognize from other programs outside of Fluent U -which again tells me that the materials I get are relevant in the real Chinese/Taiwanese culture! This app is great for ALL ages and it is efficient!! It lets you go at your own pace and there is no set dates that you have to do it!! It's awesome!! I've been learning Spanish with Fluentlu and I've only been doing it for 2 days and I have come so far!! It's incredible!!! Gracias!!! I love this app! It's a powerful language learning tool that is also fun. Short of true immersion and conversations with native speakers, watching and listening to French commercials, kids videos, etc. is the next best thing. 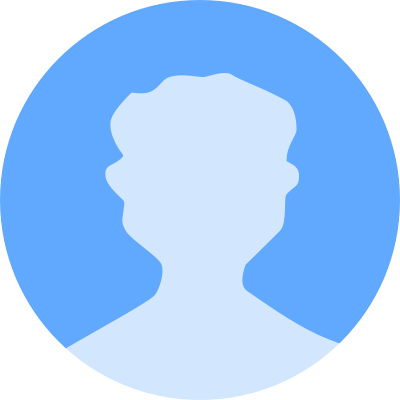 The interactive transcriptions and tutorials are great and easy to use. I like the design, it's simple and elegant. The content is extremely helpful. I was able to pronounce my first sentence in German after watching about 10 videos. I have been trying to learn Mandarin for quite some time. I have tried a lot of programs but they all seemed to fall short somewhere and I would give up. FluentU's program has met all of the shortcomings I had experienced before. The program covers everything I am looking for in my learning; new vocabulary, structure and hanzi all at my own slow but steady pace. I love that there are so many videos from different countries, and it helps you stay in touch with previous and current culture in Latin America and Spain while learning Spanish. Honestly this app is incredible and just what I have been looking for. Yes! Thank you FluentU makers!!!! Pairing word repetition with actual French speakers is more challenging and makes the language stick to a geezer brain like mine. 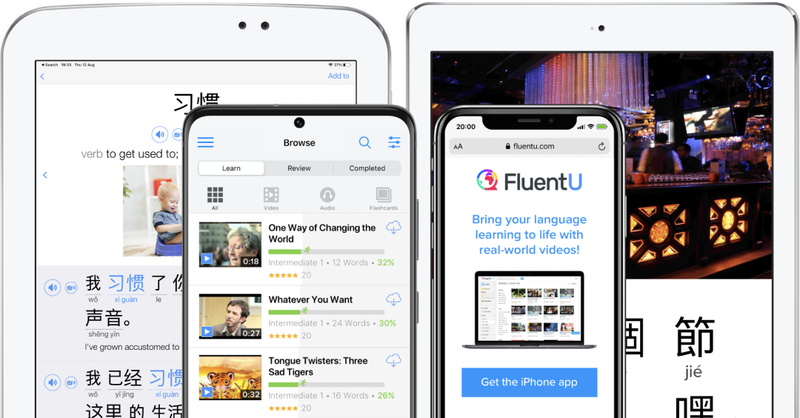 If you want to study Chinese, this is the app you've been looking for. There's something for everyone at every level. 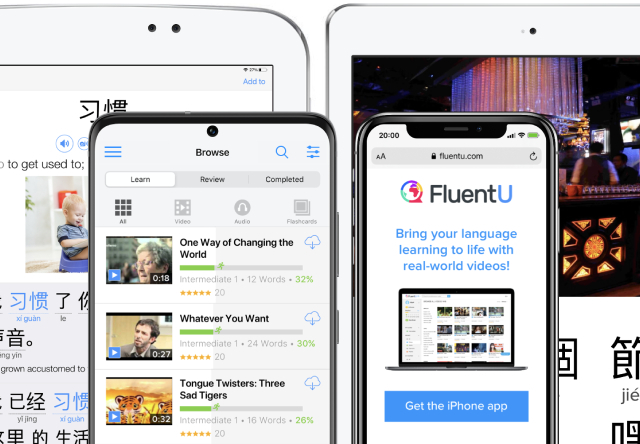 Studying Chinese particles can be a pain because they depend on context, but with this app, just tap on the word and a variety of examples clarify the meaning. And on top of that, you're watching real content intended for native speakers! 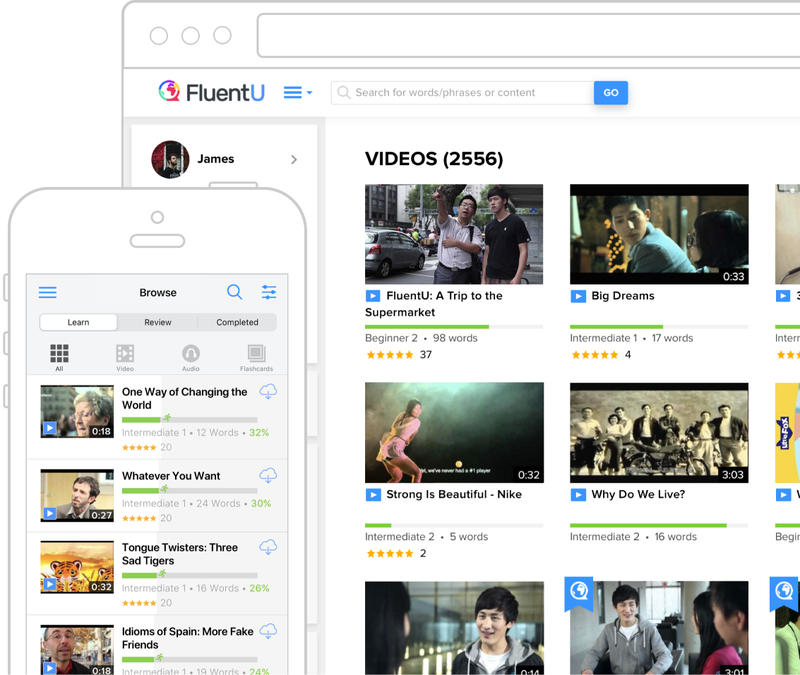 What helps me the most in FluentU is the video content. Being exposed to naturally-spoken Chinese is the best defense against a language growing rusty in my experience. Mandarin Chinese isn't really a language you can learn just from books; you need to hear the words in context over and over again before they finally sink in. 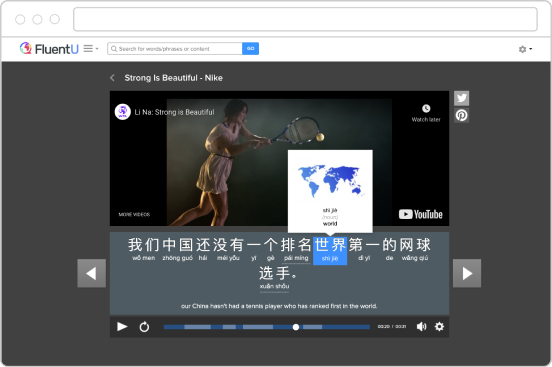 Videos are great for that, and the active subtitles make for even better in-depth learning.